Certainly, the 4D lottery must have some difference to its game if 3D has it . As a matter of fact, there are as many as 5 variations to the 4D lottery game that different companies offer to players. Without further ado, we will offer you an in-depth guide into the different variations of 4D lottery games in the articles as follow. We first start with explaining the Super 1+3D. This is a game only offered by Damacai and is simple to play. Bear with us, as the mechanics of the game may not be as easy to understand but we will break it down for you step by step. To play a game of Super 1+3D, all you have to do is to pick your favourite 4-digit number ranging from 0000 to 9999. This variation of the 1+3D game offered by Damacai has 7 unique Prize Categories – namely 1ST,2ND,3RD,STA,CON,TP3 & ALL. Next, you’ll each select a Prize Category and it is attached to every 4-digit number bet. In addition to that, there is only a single pool type available for the Super 1+3D; So you don’t have to stress on whether to wager a “A”(Small) or “ABC”(Big) bet. Lastly, all you have to do now is to place your bet amount for each combination of numbers chosen. The minimum bet amount for this game is RM1, and subsequent increases are in multiples of RM1. There are several types of play that you can choose from to increase your chances of winning the Super 1+3D. We don’t need much explanation from this. Safe to say, it is the vanilla bet of all types of bet play. Likewise to the 1+3D straight bet, all you have to do is to simply pick your numbers from 0000 to 9999 and then select a Prize Category to each chosen number. Your bet will be keyed in to the lottery company’s system as is. Can’t decide on what number to pick? Still feel like pushing your luck? Well, Lucky Pick is here to help you out! With a minimum bet of RM1 per number, you can now try your luck with a randomly picked 4-digit number generated by the company’s computer generation system. These generated numbers will have an ”LP” printed beside it. Talk about technology at its finest! This type of bet works best if you have a favourite number, but it doesn’t meet the 4-digit requirement (Think 3-digit numbers) This number may have gone through thick and thin with you and you’d like to buy all the possible digits that covers your number. The roll bet cuts short the amount of time needed for you to write the 0-9s combined with your favourite 3-digit number. Simply write an “R” next to the digit you wish to roll, and a set of 10-digit numbers will be generated. For instance, player A would like to roll the first digit of his favourite number 335, so he writes R335 on the betting paper and the computer will generate 0335,1335,2335,….,9335. The minimum amount for this bet is RM10 as player A now has 10 individual 4-digit numbers. *Note: The total minimum bet amount are based on a bet of RM1. The Super 1+3D too, comes along with the IBOX feature. This type of game allows you to cover all permutations of your chosen combination of numbers. Most importantly, for all the permutation of numbers that you have covered, the minimum bet amount of the IBOX play type is only a small sum of RM1 each! In other words…. it’s a bargain! After explaining the gaming mechanics of the Super 1+3D, we will now explain to you on the winning prize structures of the Super 1+3D and how to win it. Your selected Prize Category & numbers match the 1st prize & its corresponding winning numbers of the draw. Your selected Prize Category & numbers match the 2nd prize & its corresponding winning numbers of the draw. Your selected Prize Category & numbers match the 3rd prize & its corresponding winning numbers of the draw. Your selected Prize Category & numbers match the Starter prizes & its corresponding winning numbers of the draw. Your selected Prize Category & numbers match the Consolation prizes & its corresponding winning numbers of the draw. Your selected Prize Category & numbers match either the 1st, 2nd, or 3rd prize & its corresponding winning numbers of the draw. Your selected Prize Category & numbers match either the 1st, 2nd, 3rd, Starter or Consolation prizes & its corresponding winning numbers of the draw. The main goal of this game is for players to match their invested number-combinations with the winning numbers drawn weekly and their corresponding Prize Category of said drawings for the 1+3D Game. 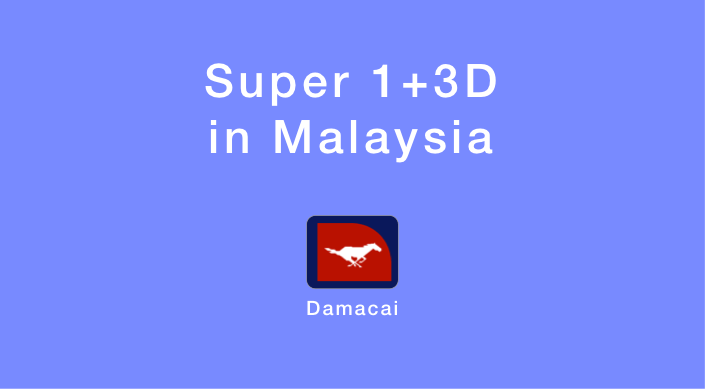 Unless stated otherwise by the lottery company (Damacai), the results of the Super 1+3D game shall follow the results as drawn for 1+3D, and complies with the Terms and Conditions for said game. However, worry not! We here at 4DKitty will keep you updated accordingly to any changes to the games. So, what are you waiting for? Follow us on Twitter or Facebook for future updates now!